Once Upon A Kitchen - I'm The Chef Too! Enter the enchanted world of reading where children’s favorite stories are brought to life and infused with deliciously clever recipes. Workshops combine the magic of storytelling with the fun of cooking. Children will enjoy embarking on a journey with their favorite characters and use their imaginations to prepare recipes from scratch. 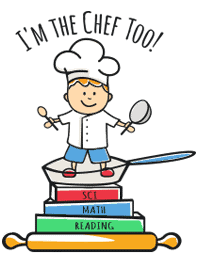 Every story is an adventure embedded with literacy skills along with the joy of cooking.